…but over the past three weeks or so I’ve already painted more than I did through the whole of last year. I must have been thinking about it on some level, but it didn’t seem to be a properly conscious decision. I think it started when I watched Tiffanie Mang on Instagram making tiny study pieces in gouache, about 2.5” square if I remember right. And they were gorgeous, like little jewels. I paint small when I’m sketching outside, but other than that I’ve never set out with the intention of making series of pure practice pieces. Sure, I’ll knock out quick pencil thumbnail sketches when I’m planning a painting, but nothing beyond that. So, I rummaged through my stock and fished out a big sheet of 250lb Bockingford NOT watercolour paper. I divided it into eight equal format rectangles each 14cm wide by 9cm high using masking tape. 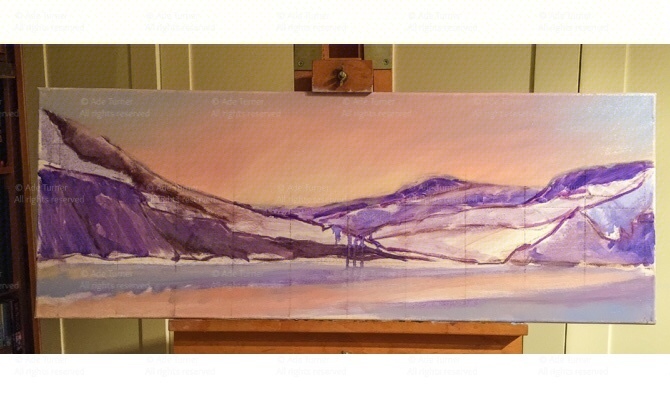 Timing: each painting session to take no longer than 1 hour (later revised down to 40mins). At the end of which time, brushes down whatever the state of the painting. Gouache: I specifically wanted to concentrate on this water-based medium. Big brushes: to force me to paint loose I would use only half inch flats: straight, angled and ‘vegetation’ (that’s a ragged brush, ideal for quickly generating the impression of grass and stems). My usual gouache palette – Cadmium Red Pale, Alizarin Crimson, Ultramarine Blue, Indigo Blue, Cobalt Blue, Lemon Yellow and Cadmium Yellow Pale, Permanent White, Ivory Black, Yellow Ochre, and Burnt Umber. From photos: these were never going to be ‘plein air’ sketches. The photos were chosen ‘at a glance’ they had to appeal to me within a couple of seconds. And here are the results. I’ve completed two sets and am about to start a third. I have to say, the whole exercise has been a bit of a boost. And, the icing on the cake is that they have proved popular, with all but 2 of the first series being snapped up in a couple of days. The best place to follow my progress as I produce these sets is on my Facebook or Instagram accounts. You’ll also find out details about how to buy one should you fancy at £25ea plus postage unframed. But they are proving popular so if you want one, do let me know. Its already shaping up to be an interesting year. This year was always going to be ‘interesting’ and, as the nights draw rapidly in, I’ve been reflecting on my progress so far. You know what, in general I think it’s all been good. While I’ve not been very prolific, I sense the quality of my paintings has definitely improved. And when I think back to the mental health issues which dragged me down over the past 3 years or so, I’ll take that as a ‘good thing’. This year I’ve tried not to put myself under pressure to create. I’ve largely done whatever I fancied, and only when I fancied doing it. And if some things have been left hanging, the lino-printing for instance, then so be it. At the moment I’m fortunate in that this is not my prime income and I also have a ‘proper day job’ to pay the bills. So, over winter I may not paint at all now I’ve finished my latest commission. I don’t even know yet whether I’ll pick up the lino cutting either. It’s an easier option than painting as I hate to paint under artificial light, even using my wonderful OTT-Lites. I won’t be idle of course. The new website is still on the cards but, hey, who really enjoys putting that stuff together; it might go to the back of the queue. I will sort out those Giclee prints I mentioned last time. And I’ve plenty of non-painty things on the boil too, including decorating (which I hate by the way…), figuring out how to use my new 8” telescope, a couple of 1/10th dinosaur sculptures which I want to prepare, modify and paint. Oh, and Red Dead Redemption II for my Xbox – it is gaming season after all, and I can see myself being lost in that for weeks. So, a quiet and hopefully relaxing winter and early New Year coming up. I will still be posting on FaceBook from time to time, so head over there and please Like my page if you want to keep up with any updates. Anyway, prints. 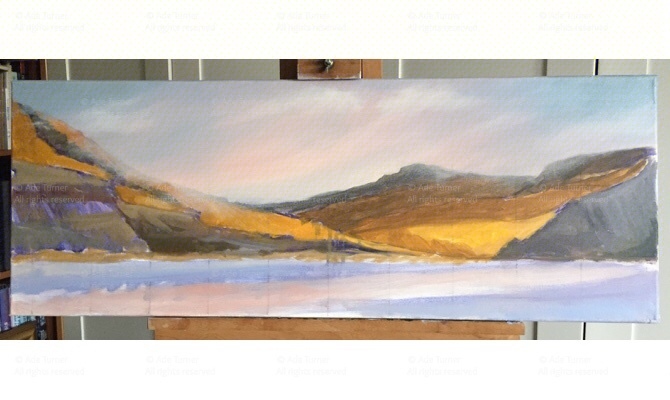 You will soon be able to buy high quality Giclee prints of a selection of my paintings. First off the mark will be a couple of my latest gouache paintings. I’ve been working with Sarah at Ironbridge Fine Arts and Framing to colour match the scans of my paintings to be as close as possible to the originals. I’m very impressed! Comparing my paintings and test prints side by side it really is hard to tell at a glance which is the original. Giclee prints are made using top-of-the-line inkjet printers. While the technology is similar to your home deskjet printer, Giclee printers can use 12 inks rather than 4. This means they can achieve very subtle colour graduations which closely match those in the original painting. During printing the size of the spray droplets varies which makes for a less ‘mechanical’ finish. And the ink is archival quality so each print will have a long life with less likelihood of fading. Once printed onto an acid-free, lightly textured watercolour paper the results are brilliant. Which paintings will be available? I will be offering both unframed without a card mount. Besides giving you the freedom to present them exactly how you want, this also means I can keep the price point affordable. I’ll post up full details of price, size etc. once I’m ready to go, most likely mid to end of October (I have a holiday coming up very soon). Meanwhile, if you are already interested, please contact me now and I’ll get in touch when they’re available. Over the years I’ve used, and dabbled with, all manner of media. Ive tried watercolours, gouache, oils, alkyds, water soluble oils, acrylics, acrylic ‘ink’, traditional inks, silk paints, coloured pencils, charcoal, Conte crayons, graphite sticks and pencils, and pastels. And probably a few others. My art drawers are crammed full of ‘interesting’ tubes of stuff, all are slowly fading away in the darkness, some sit alone and unloved. It was only while confined to our holiday cottage on a drizzly day in June (remember drizzle…?) that I started a ‘proper’ painting in gouache. I’d deliberately left my oils at home, so it was Hobson’s choice – pure watercolour or gouache. And here is that painting: Towards Lloyd’s Signal Station from Pen Olver’. It’s on 450gsm Hahnemühle 50cm by 20cm NOT watercolour paper. Looking back, I was surprised how much brighter and more colourful my gouache paintings seem compared to my plein air oils. 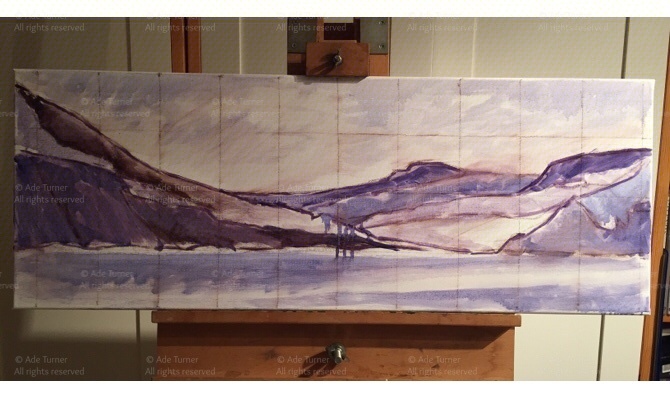 I roughed in a tonal underpainting using Turner acrylic gouache. Despite its name I don’t see it as a real gouache. It’s basically opaque acrylic paint suspended in a matt binder. For me it doesn’t ‘feel’ like the real deal. However, being acrylic I could paint over it without lifting any colours. Now I’ve gained a little more experience I’m not sure I’ll use the acrylic gouache again. I’ll probably make my underpainting direct in Winsor & Newton Designer’s gouache. They have a lovely creamy feel, are well saturated with pigment and dry to a velvety matt finish. However, brushstrokes must be confidently placed and then left well alone. Prodding and poking at a newly laid wash overlying a previously layer can lead to unexpected results. Sometimes this gives rise to ‘happy accidents’, but most often it results in a mucky mess. It’s this need for confident handling which determines the characteristic look of many gouache paintings – think old railway posters. The more I work with them, I’ve found I can make blends up to a point, but laying a thin glaze over previous layers is asking for trouble. I am still finding my way. With my latest painting, ‘Ancient Landscape’, I feel I’m pushing against the limits of layering. Some areas sport about 10. On balance I think I need to try and achieve my goal in as few layers as possible, which means cultivating and maintaining spontaneity and confidence in my brush work. More practice then! There’s a definite whiff of neglect in here isn’t there…? A lot’s changed since last I was here. Over the past 3 years my mental health has been on-and-off grim with the second half of 2017 being particularly awful. However, since Christmas a switch seems to have flicked and I’ve seen a real, rather than temporary, improvement. Don’t care what’s actually changed, I’m now feeling great. There, all caught up. Well, nearly. Second, I ordered an etching printing press number 1 handmade to order by David Gunning’s team at the Ironbridge Fine Arts & Framing. I’ve only dipped into linocuts a couple of times, but really enjoyed it… apart from printing using the back of a spoon. Results were very mixed and I could see that it wasn’t going to be a fun way of producing more than a handful of prints – hence the press. Third, I think I may have finally found my ‘thing’. I’ve always thought that oils were my ‘go to’ medium, but lately I’ve been getting really encouraging results with gouache (see my site banner). I can see real potential there. More about all of the above soon, hopefully with pictures too! Finally you might have noticed I’m trying to tidy this place up. So, if you find something doesn’t work, has gone missing or looks odd, it’s just me tinkering. Annual holidays eh? Such a treat! For me they are increasingly a chance to get some mental breathing room to rein back my long-standing depression and let me paint for a while. Change of location I guess, away from everything. Lovely. So, in a couple of weeks I’ll be off again to my all-time favourite destination, the Lizard Peninsular in Cornwall. I love working plein air, usually with a pochade box, a tripod and oils or acrylics. This year however I’m leaving all that malarkey at home so I can concentrate on watercolour. Must say I’m nervous. I’m far more comfortable painting in oils or acrylics, but on the plus side this is an opportunity to practice. And, as a bonus, the switch will make my kit considerably lighter. My back’s going to thank me for that! But, when I work on holiday my paintings are usually only intended to be sketches for pleasure, not finished pieces. Does it really matter how I resolve an image as long as it works for me? I guess not. Big plan then: loosen up and to hell with that transparency gig. I’m taking gouache. And pastel pencils too. I can hear the purists screaming; I feel your pain. My trusty Frank Herring Dorchester watercolour palette. I’ve tried many through the years and always come back to this one. Lightweight and with plenty of mixing room. And as I’ve had it since the early ‘90s, I guess it’s pretty robust too! W&N and Holbein artists’ gouache, although I’m not too certain about the latter. Probably my lack of experience, but I find the Holbein extremely strongly tinted and difficult to handle. 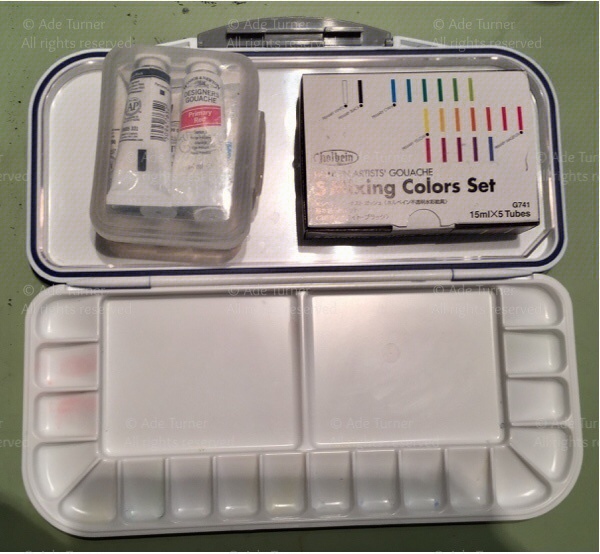 A self-sealing palette specifically for the gouache. Not tried this one before, (pinched it from Carole…), so let’s see if it really does keep the paint moist without an unholy mixture of runny Ultramarine and Alizarin Crimson dribbling into my rucksac… Colourful, but it makes a real mess of your butties. Da Vinci sable travelling brushes 3, 6 and 10. A selection of synthetic brushes for the gouache. Pastel pencils. Looks like I’m taking a lot, but will edit down each day depending on what I’m doing. Various graphite and carbon pencils for sketching. There’re a few spares in there so again I’ll edit down to essentials once I arrive. Masking tape (broad and narrow). I like to divide my pages, and a white border always looks so good. As usual I’m going to keep my colour palette simple with warm and cool variants of the primaries: 2 reds, 2 blues and 2 yellows. I’ll supplement these with a few earth colours and darker variants to create denser areas of tone. For paper I’ll be using my favourite: Saunders Waterford both in a large hard bound book (my Cornwall book) and in a few pads. I’ll also take my Stillman and Birn sketch pad and a Moleskine watercolour journal for ‘light’ days. And that’s it. Hopefully, Wi-Fi willing, I’ll be able to post more when I get down there. In the meantime remember I’m often more active on my Facebook, Instagram and Twitter accounts so please check me out there too. I always look forward to my visits to Cornwall, it really feels like a second home now. This time we’re celebrating my wife’s ‘big’ birthday, so we’re here for three whole weeks. We’re about to go into our third week. It’s not meant to be a painting holiday, but I’ve brought my plein air kit anyway! Oils this time rather than my usual acrylics. To be honest, since we arrived on the Lizard Peninsular from our first week on the Isles of Scilly the weather hasn’t been exactly clement. A succession of storms have passed through, including a spectacular one at three in the morning which was more than biblical in proportion. Thunder and lightning accompanied by the most severe torrential rain I can recall seeing. Not good. So in between relaxing as a family and dodging the weather, times to set up and concentrate on painting have been relatively few. I have sketched a little, but not very much. Here are my three 8” by 10” efforts in oils to date. The first is a view from our cottage garden. I’ve moved a few things round, but I’m still not that happy with the composition. The second is in one of my favourite spots on the Lizard, Poltesco a long abandoned serpentine works. And the third is a roundhouse from the 16th century on the road to Church Cove. It’s been very restful using oils again. So much more time to think about colour mixes. Acrylics are very unforgiving. Turn your back and they turn into an immovable solid lump of plastic on the palette and brush. It’s nice to be able to take the generous time which oils allow. Hopefully I’ll get a chance paint some more in the last week of our holiday. If I can, great, if not, oh well, the holiday comes first. Remember, my FaceBook page is often updated first with snippets and odds and ends. With my studio still stuffed full with boxes of stuff from my late Dad’s estate, apart from making occasional sketches I’ve not been at all productive over the past 18 months. I completely underestimated the sheer physical amount of personal material I’d have to pick through and the ongoing, negative emotional impact that would have. In truth, I’ve had neither the time nor inclination to get stuck into anything very much. Before I completely filled the studio, early in the year I started a new commission in alkyds, a pet portrait of a gorgeous Italian Spinone dog. As I needed to work from photos I’ve found my iPadPro remarkably useful, being able to zoom in and adjust the lighting to reveal structural detail at will. At the moment this is on hold with my client’s blessing, but it is close to completion. Unfortunately at 70cm by 100cm it is rather large, and I’ll only be able to finish it once my studio’s clear again. At least my June holiday gave me time to settle and sketch. 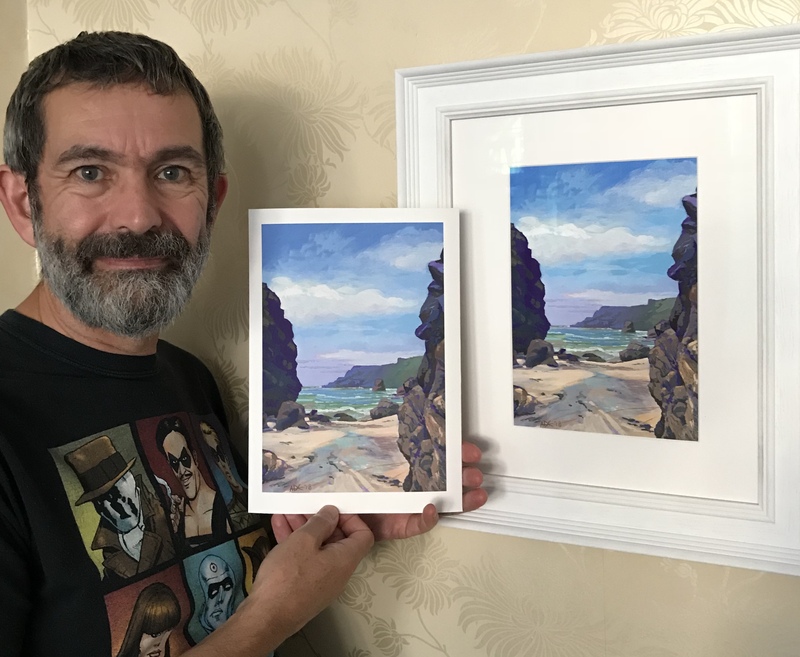 Here are a few 6″ by 8″ acrylic sketches from my visit to the Lizard peninsular in Cornwall. And I’m off again in September. First to the Isles of Scilly for 1 week and then the lizard again for 2 weeks. A three week holiday! I won’t want to come back! My plein air kit will go with me of course. I’m still undecided whether to take oils instead of my usual acrylics. So many advantages including extended drying time and retention of brush strokes. But after a few trial runs in the garden I really need to brush up. I seem to be very good at making panels of mud! 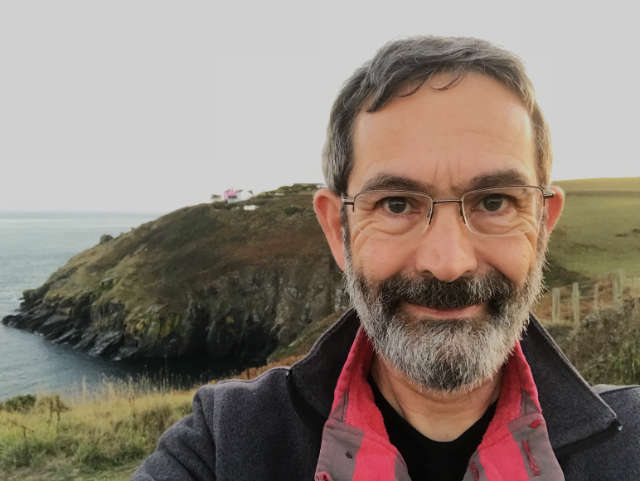 With things as they are at the moment it’s a lot less of a faff for me to upload a post to Facebook and Instagram than this blog as I can easily do it on the fly from my phone. So, if you’d like to see more frequent updates, please head on over and like my FaceBook page. Over Christmas I had the urge to do something creative, but a little less demanding. 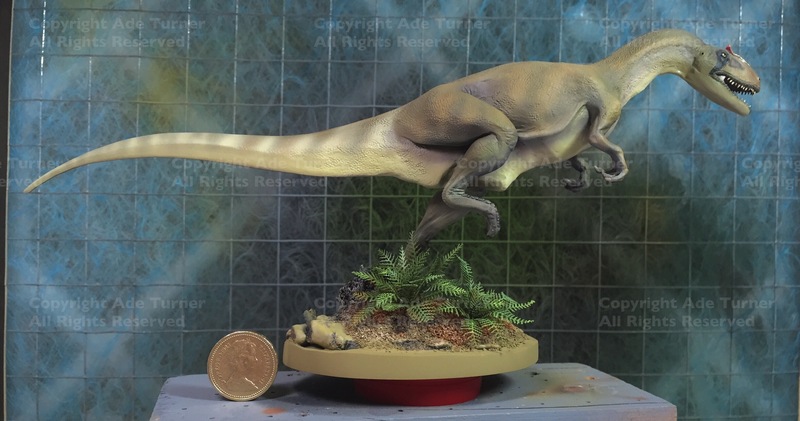 Back in February 2014 I wrote about a small sculpture I’d created of Allosaurus fragilis, a Jurassic Theropod dinosaur. Frankly this had been lurking in a box ever since I made it, so I decided it was high time to get it out, dust it off, give it a decent paint job and finish it. I tackle painting a sculpture like this with some of the same sensibilities reserved for making a traditional painting on canvas. The tools and paints may differ, but there are parallels, with careful control of hue and tone used to suggest texture, form and distance. However, I have to say I find this sort of task easier than painting because in some ways it feels a little like 3D colouring-in with clearly defined areas to tackle, the mouth, teeth, hands etc. I’d spent a lot of time trying to ensure the sculpt was as accurate as I could achieve, and I also wanted to make sure my colour scheme was plausible. Allosaurus was a hunter, and as a rule of thumb standing out from your surroundings really isn’t helpful when stalking prey. So I decided on a muted palette with soft stripes and a counter change of lightish undersides and darker upper body to break up the dinosaur’s profile against the tree line. I originally intended to go quite light and sandy for the main colourway, but it evolved into what became a pleasant dusty, warm green. I used Tamiya liquid acrylic paints in an Iwata Eclipse airbrush for the bulk of the work. Detail was added over the top using Liquitex Heavy Body acrylics and tiny brushes; my poor eyes! This dinosaur is at 1/30th scale, less than 12” from snout to tail, and in common with other small models or sculpts I started by applying a dark purple pre-shading layer over the primer. This informed both the position of the stripes, and helped to define shadowed areas under its limbs. This pre-shading is needed because the effect of ‘real’ light on something so small simply doesn’t always give a convincing ‘weight’ and presence. Colour too has to be modified. 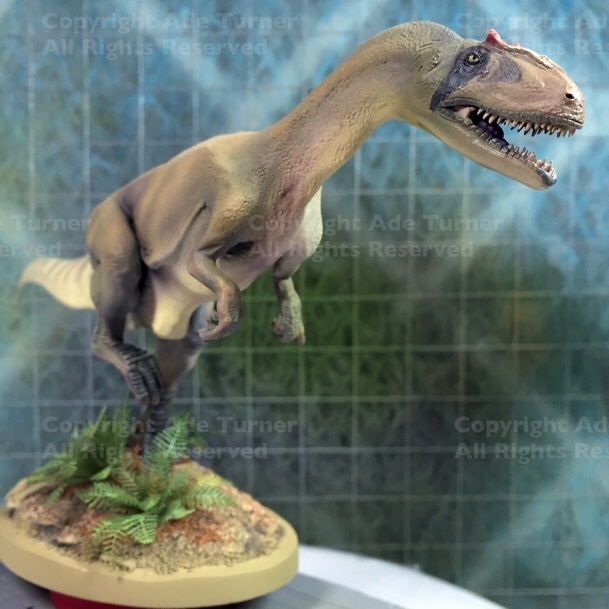 When you view a 12” sculpt of a dinosaur from three or four feet away, it’s the equivalent of looking at the real thing at a considerable distance. At full size the atmosphere between the viewer and subject reduces contrast and makes things appear lighter and bluer. To replicate this in miniature the colours I used were deliberately lightened and toned down to achieve a more convincing reconstruction. Well, here we are on Christmas Eve. You know, it really doesn’t feel like two months have gone by since my last post. These long gaps are getting to be a bit of a habit. I was really on a high when I returned, but once the initial post-holiday buzz wore off and the nights drew in everything’s become, well, bloody depressing again if I’m honest. Second, and I know it’s not a good thing to be breathing it in, I do so love the smell of turps! They reckon smells are strongly linked to memories and that’s what I’m finding. The warm and heavy resin scent takes me back to when Mum and Dad bought my first set of oil paints when I was about 11; a Christmas present I think. 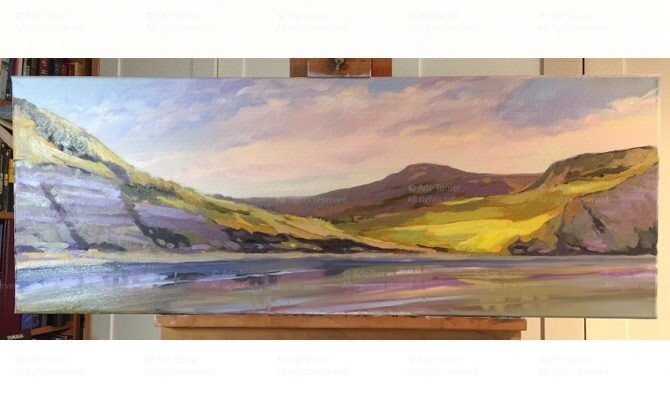 It made me feel dead grown up – a real oil painting set, just like what ‘proper’ artists use! I was really made up, and somewhere my first efforts are still waiting to be discovered round at Dad’s house. Of course I had absolutely no idea how to use them. My only painting experience was with the hard, gritty slabs of school poster paint. So, I used lots and lots of turps to thin them to within an inch of their life; nice and sloppy. And then I’d mix them; all of them. Whatever I mixed, it usually came out as a bluey shade of brown. Well, I was only 11. Any understanding of colour and tone was still a far distant star… But it was such a joyful experience rubbing my ridiculously dribbly oil paints over tiny rectangles of oil paper. Without the gift of that experience and Mum’s constant encouragement, “never let your painting go”, I probably wouldn’t be painting now. So I set out an 80cm by 20cm canvas, squared up the drawing and thinly washed in the keynotes before working over in thicker paint. At this end of the year I tend only work at weekends when I can make use of the daylight. I have some very good Ottlite daylight lamps, which I find great for small scale work, but I don’t find them comfortable for sustained working over a largisih painting. So now the winter weather has turned day into fifty shades of grim and gloomy grey, I’ve stopped painting for the moment. Fingers crossed though, over the Christmas break, I’m hoping we might get some clear bright weather so I can tinker once more. In the meantime here’s hoping you and yours have a lovely Christmas and a Happy New Year.